Get your crewmember back onboard fast! The Lifesling2 system consists of a flotation collar which is a blend of the traditional horseshoe buoy and a helicopter rescue sling. It’s connected to 125' of multi-filament polypropylene retrieving line which allows the flotation to be towed or thrown to the overboard crewmember. The collar and line are stored for protection against the elements in a rigid and attractive vinyl storage bag. Graphics on the bag clearl illustrate the instructions for recovering a person in the water. 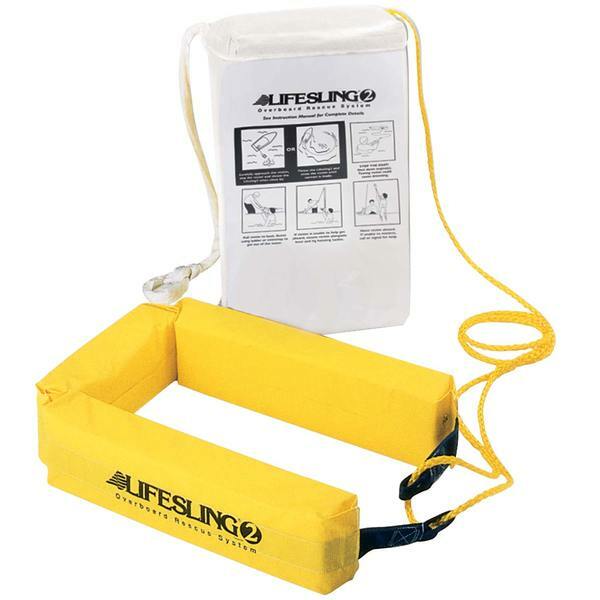 Note: This USCG-approved Lifesling2 is for powerboats with a lifting point 10' above the water, and sailboats over 20' LOA. Also view Lifesling3, made for use on larger recreational and commercial vessels.